Olivia Blom joined Disability Rights Maine in 2018 as an advocate under the Developmental Services Advocacy (DSA) program. As part of her advocacy, Olivia monitors reportable events that involve the rights of people with developmental disabilities. Olivia recently received her B.A. in Political Science from the University of Pennsylvania. 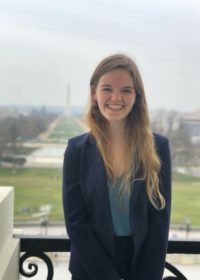 While at Penn, Olivia volunteered as a peer counselor for students navigating campus resources and worked in an office serving children on the autism spectrum and their families. A lifelong Mainer, Olivia graduated from Deering High School in Portland and is thrilled to be back home working with people in her community.